Fancy winning a lovely diary for 2016? Astrocal is running a competition with prizes of Astro Moon Diaries and Lunar Pocket Planners. To find out what the diary and planner are like, you can read my review. A common question witches get asked is, "Why follow the Moon?" There are, of course, many different answers to this question, so Astrocal thought it would be interesting and useful to create an eBook that illustrates a range of people's various experiences. The competition is asking just that question. Astrocal is looking for personal thoughts and reflections, beliefs and observations. What attracts you to the Moon? Is your mood affected by the Moon? Do you garden by the Moon? What have you concluded? Do you honour the Moon's cycle? What do you include in your ceremony? You can answer with pictures, photographs, ideas, tales, poems and stories. 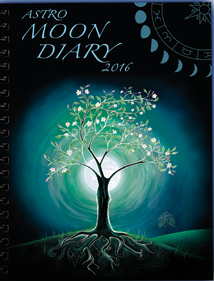 Every chosen submission wins a Lunar Pocket Planner and each month one chosen entry wins an Astro Moon Diary. The competition is open until the end of January 2016. Astrocal says winners will be chosen and sent prizes at the end of each month.